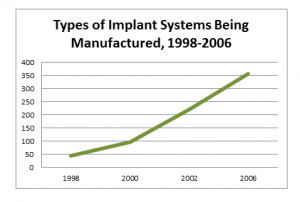 Are Dental Implants Created Equal? When choosing dental implants for our patients, there are thousands from which to choose from and that number continues to rise. How does a dentist decide how to choose the right system for patients? The answer is a complex combination of mechanics, chemistry, physics, research, training, and experience. First and foremost, we choose dental implants that are manufactured by reputable companies with a longstanding history in the business and whose products have proven successful in reputable clinical trials. The true cost of dental implants depends on the outcome: an inexpensive dental implant isn’t inexpensive, in the long run, if it fails and the work has to be redone. Titanium and titanium alloys have been the most common material used for dental implants, although zirconia is growing in popularity. Both offer biocompatibility with the surrounding bone and soft tissue and strength which, when placed correctly, will withstand the test of time. Dental implants come in an array of shapes and sizes, from diameters of 2mm up to 6mm, and lengths of 6mm – >13mm. An experienced dental implant specialist considers many factors including the amount of bone present, proximity of the surrounding nerves, and angle at which the dental implant must be placed in order to withstand the load produced by chewing. For example, we may place a dental implant of up to 52.5mm in a patient during an All-On-4 procedure for a patient with limited bone in the maxilla. The length allows us to actually anchor the dental implant in the cheekbone to achieve the greatest stability and strength. After 25+ years placing and restoring dental implants in Tacoma and elsewhere, I continue to find this a fascinating profession. As dental implants evolve it’s essential that we, as professionals, continue to evolve with it, in order to provide the best possible care for our patients.